Slowly, slowly, the big city creeps out of sight. The frequency of the passing stations gets less, the grey slowly turns into a muffled green. A train ride as such is already a decelerating experience. Locomore is taking conscious and slow travelling one step further. Since December, the bright orange train compiled of upcycled 1980s train wagons is operating on green electricity between Stuttgart and Berlin and is bringing Berliners by choice home safely for the Holidays. While the ICE advertises speed, electric sockets at your seat and permanent wifi, Locomore attracts with fair and organic food, Neumarkter Lammsbräu beer and theme compartments in which you can travel with like-minded companions. With the business ticket you get more space for working, a comfortable cushion, newspapers as well as snacks and drinks. 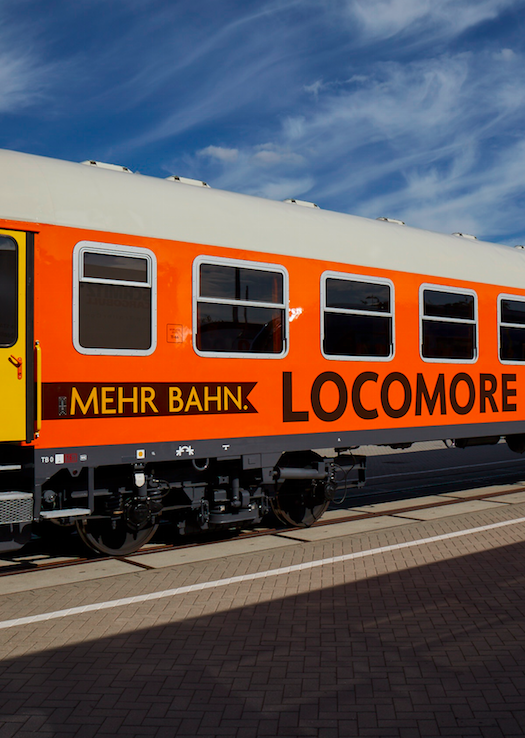 Managing Director Derek Ladewig already founded Locomore in 2007 with the goal of getting an alternative to the Deutsche Bahn on the tracks. It’s a little David-Goliath-story. But a romantic one. 1300 people invested 600,000 Euros via crowdfunding because they believed in the small, bright orange contender. The ticket prices are fair and cheaper than comparable offers by DB. For three months, the 500 seats have to be half-full in order to enable the expansion to Rügen, Munich and Cologne. A railwayman-Christmas-fairy tale, of which we someday hope to be able to say: and they railroaded happily ever after. The muxmäuschenwild MAGAZINE is a weekly email newsletter for Berlin and Hamburg – made with you, for you and with all our heart. We don’t simply make a list of everything of what is hot or not, but instead we only recommend things we really like and have tested ourselves. In a nutshell: products, projects, people, places and events that have all earned the label „muxmäuschenwild“. © 2019 muxmaeuschenwild-magazine. Alle Rechte vorbehalten.